Buckaringa Wildlife Sanctuary conserves over 2000 hectares of the central Flinders Ranges in South Australia. AWC plays an important role in conserving the nationally threatened Yellow-footed Rock-wallaby by protecting a significant population on the property. Buckaringa offers spectacular scenery, with rugged quartzite ranges and steep cliffs dissected by redgum-lined creeks and broad valley floors. Buckaringa sits between the cooler, wetter and more vegetated southern section of the Flinders Ranges and the warmer and drier northern section, where vegetation is more sparse. As a result, the sanctuary contains a rich diversity of flora and fauna. The most significant species is the nationally threatened Yellow-footed Rock-wallaby, one of Australia’s most beautiful macropods, but the property is also home to a suite of declining bird species. The sanctuary is part of a folded sedimentary sequence of sandstones, siltstones and shales. While the sandstones are relatively resistant to erosion, the siltstone and shale erodes easily, revealing the folded sandstone structures that form the current pattern of ridges and ranges. The quartzite of the main range on Buckaringa forms a ridge with a steep cliff along its eastern side. The two gorges on the property (Buckaringa and Middle Gorge) cut dramatically through this ridge at right angles to the strata, creating numerous crevices and caves. The remainder of the sanctuary consists of ridges and bedrock plains carrying shallow soils and rock debris, with deeper soils on the flatter alluvial areas away from the rocky outcrops. Buckaringa’s climate is characterised by cool winters with cold nights where the temperature frequently falls below 0°C, and hot summers with daytime temperatures often over 40°C. It is in the transition zone between the predominantly winter rainfall areas of the southern Flinders Ranges and the summer rainfall areas further north. Over 320 plants species have been recorded at Buckaringa, including some threatened species such as sandalwood. The property contains a range of different habitat types: open Acacia shrubland with native grasses, saltbush and bluebush; spinifex grasslands; Redgum creeklines which are important habitat for hollow-nesting species; rocky shrubland; Black Oak woodlands and native pine woodlands. The variety of habitats on the sanctuary support a diverse range of wildlife. Most importantly, Buckaringa protects a significant population of the nationally threatened Yellow-footed Rock-wallaby in the southern Flinders Ranges. Originally hunted for its spectacular pelt, this species has declined further due to predation by foxes, competition with feral goats, and loss of habitat. Buckaringa is an important and secure refuge for the species. Around 120 species of birds have been recorded on the property, including significant species such as the Diamond Firetail, Peregrine Falcon, Elegant Parrot and Gilbert’s Whistler. There is suitable habitat for the Short-tailed Grasswren – the only Flinders Ranges endemic bird – which has been confirmed in the immediate vicinity of the property. The reptiles at Buckaringa range from the smallest skinks to large goannas, and there are at least two frog species – one of which is a Flinders Ranges endemic species – that appear in small pools and rock holes after rain. The land management at Buckaringa focuses on habitat protection by controlling weeds, fire and feral herbivores; removal of feral predators; and an ongoing survey effort to track the ecological health of the sanctuary. Wildfire has not been a major threat to the ecosystems at Buckaringa, however AWC is developing a strategy for prescribed burning that will increase the ecological health of some habitats. Our staff and volunteers have successfully eradicated several weeds from the property, and are now focusing their efforts on Creeping Wheel Cactus. It has been mapped and treated with herbicide injection across the entire sanctuary. Over 5000 individual plants were treated in this program, and now management involves monitoring and treating regrowth and seedlings. There are a number of other significant weed species also being mapped and treated. Goats and rabbits occur at moderate to high densities in the region. AWC has an ongoing goat control program using a combination of trapping, mustering and shooting, carried out in conjunction with the local NRM Board. The population of goats on Buckaringa is now very low, although invasion from neighbouring properties is an ongoing issue. Rabbit control includes shooting, the destruction of warrens (to date, over 150 warrens have been destroyed), and baiting if required. Feral cats and foxes occur at high densities across the Flinders Ranges, and are an ongoing predation threat for native wildlife. AWC implements fox control comprised of baiting and shooting. Baiting is undertaken on a quarterly basis, and bait take is monitored. Feral cats are shot opportunistically, often on regular spotlighting transects. Unfortunately there is no landscape-scale method for feral cat control, but AWC is undertaking research across our network of sanctuaries to develop more effective strategies. Science forms the backbone of all the work done by AWC staff, and the results of our ecological surveys inform all of our land management strategies. At Buckaringa, AWC conducts regular trapping and spotlighting surveys across 18 fauna monitoring sites. This monitoring measures a suite of ecological health indicators, such as the diversity and abundance of key faunal groups like birds and ground-dwelling reptiles. AWC also undertakes dedicated monitoring of the Yellow-footed Rock-wallaby population, quarterly bird surveys, vegetation surveys, and transect surveys to measure feral animal activity. Our performance against these indicators provides rigorous scientific data which enables us to track the ecological health of Buckaringa. 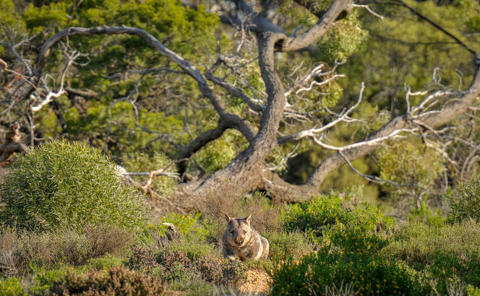 The most significant threat to wildlife in the Flinders Ranges comes from feral animals, both as predators and competitors. Cats and foxes prey directly on native wildlife, particularly small mammals. AWC is undertaking research to develop effective, landscape-scale methods of removing feral cats. Feral herbivores can be incredibly destructive, and compete with the Yellow-footed Rock-wallaby for habitat. The removal of feral goats at Buckaringa has been quite successful and densities are now relatively low, however they still have a huge impact on the environment. AWC plays an important role in conserving the Yellow-footed Rock-wallaby in the central Flinders Ranges.